Lex Luthor's first appearance was in Action Comics #23 (April 1940). He actually had hair in that initial appearance. 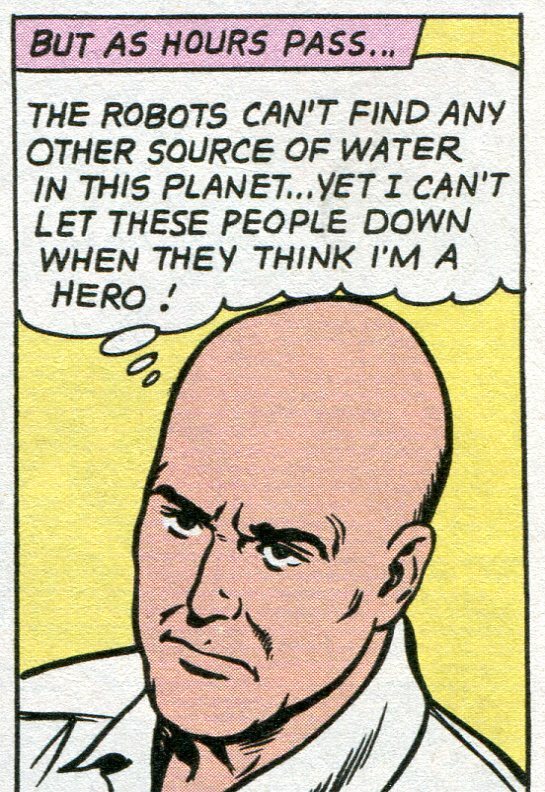 But whether his head was full of hair or whether he was bald as a cue ball, he soon established himself as Superman's most persistent enemy. He was, of course, a mad scientist, able to invent all sorts of bizarre super weapons in his attempts to destroy Superman and/or conquer the world. It was his intelligence--he may very well be the smartest man in the world--and the imaginative albeit evil inventions he uses that made him a villain who could believably take on the Man of Steel. 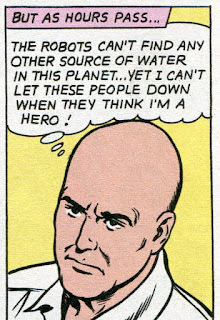 Before long, Lex was being drawn as a bald guy--probably to give him a little more visual distinctiveness. But it was a full two decades after his first appearance that we finally find out why he's bald. Jerry Siegel, who created both Superman and Lex, was back with DC Comics in 1960 and he--appropriately enough--finally explained Lex's lack of hair AND his hatred of Superman. 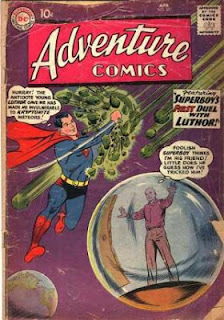 "How Luthor Met Superboy" was published in Adventure Comics #271. It's here we find out that a teenaged Lex, with a full head of red hair and dreams of becoming a scientist, lived in Smallville at the same time Clark Kent did. 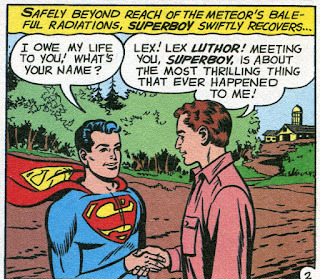 This is a pretty cool situation for Lex, because he has a serious case of hero-worship for Superboy. When he gets a chance to save Superboy from some kryptonite, the two become friends. Superboy builds Lex a modern lab. Lex quickly shows his scientific smarts by creating artificial life. But a lab accident causes a fire and, when Superboy blows the fire out, some toxic chemical fumes cause Lex's hair to fall out. That sends Lex off on a quick trip to Crazy Town. He vows eternal hatred of Superboy. The situation is exacerbated when Lex tries several experiments to improve crop production around Smallville. 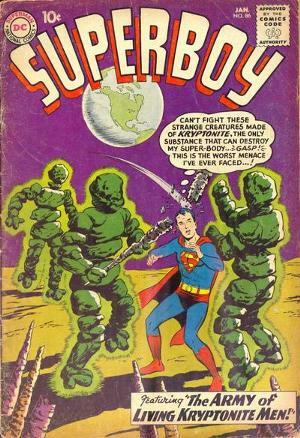 These go awry, forcing Superboy's intervention. 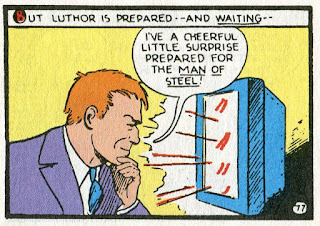 Lex, in his current frame-of-mind, assumes the Boy of Steel is actually sabotaging his efforts. By the end of the story, Lex has made his first attempt to kill his former hero. This becomes his life goal. In Superboy #86 (January 1961), for instance, he uses a mind-helmet to animate a small army of rock-men made from kryptonite. 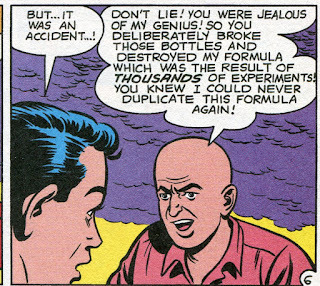 So by the time Lex and Clark are adults, the now-mad scientist is one of the world's most nefarious super-villains. He was pretty much an out-and-out villain, but there were occasional (and relatively successful) attempts to humanize him. In another instance, he shows regret when he inadvertently stops Superboy from preventing Abraham Lincoln's assassination. 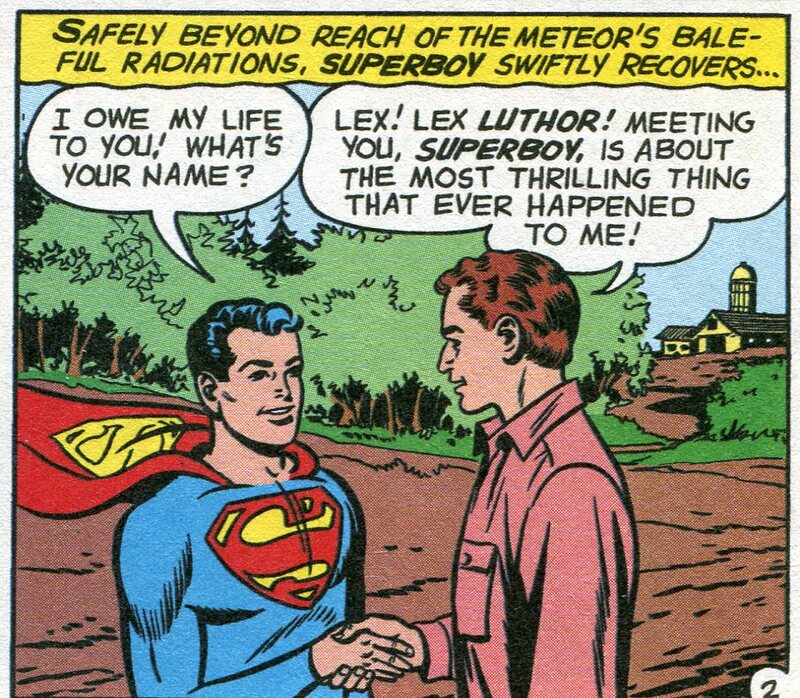 But it's in Superman #164 (October 1963) that Lex receives his most effective bit of character development. I've actually written about this story before in an old post about Edmond Hamilton, but it's worth revisiting. After escaping from prison again (because some doofus of a warden let him use the machine shop! ), Lex challenges Superman to a one-on-one fight on a planet with a red sun, where the Kryptonian will have no powers. Figuring that the world will lose confidence in him if he refuses, Superman accepts. 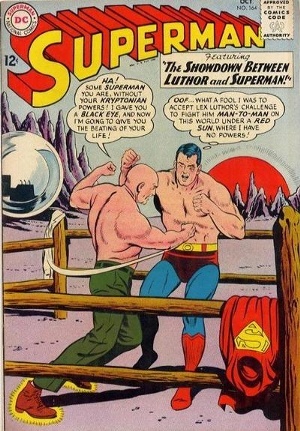 The duel starts with a bare-fisted boxing match, but soon Lex is using some of the scientific gadgets he smuggled to the planet to cheat. But the situation changes when Lex discovers there are people living on the planet--a race that has forgotten how to use the technology designed by their ancestors and is now suffering from a massive water shortage. Lex helps them drive off some large birds that were about to ravage their crops and becomes a hero. He finds he likes being a hero and, when his duel with Superman resumes, he throws the fight and willingly goes back to jail in order to get Superman's help in saving the people. It's a great story. On top of Hamilton's usual skill in using comic book logic to built an imaginative but internally consistent story, this view of Lex really does give him some depth and generates a bit of honestly-earned sympathy for him. Heck, Lex is such a hero to these people that they rename the plant Lexor. He even marries one of the inhabitants--a pretty lady named Adora. They later have a son. It gives Lex an aura of tragedy, making him that much more interesting a character. 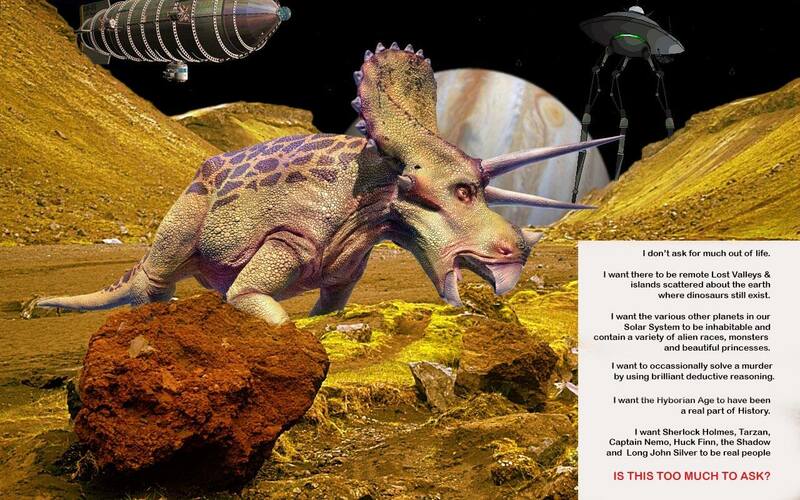 Here's a planet where he's admired and respected. He has a wife and son who love him. He is able to live a constructive life of service to others whenever he visits and take satisfaction from that service. But he can never bring himself to completely give up his vendetta against Superman. His unwillingness to give up his hatred means he stays a villain forever. 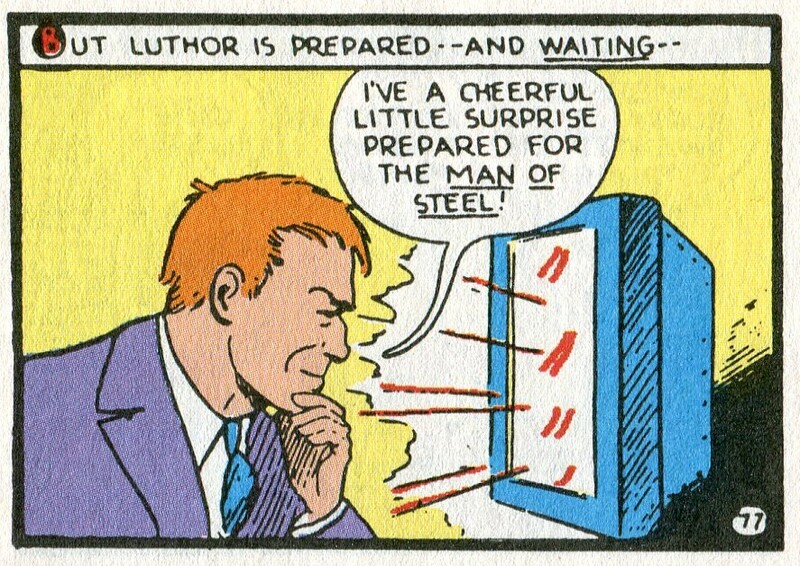 In a 1983 issue of Action Comics, this has some rather tragic consequences for the entire planet of Lexor. We have a couple more villains to cover, but eventually, we'll visit one of the "imaginary" (out of continuity) tales from the era. That one involves Lex at his most villainous and it my personal favorite of those imaginary yarns. Let's All Do the Charlton!